The Earth is often compared to a majestic blue marble, especially by those privileged few who have gazed upon it from orbit. This is due to the prevalence of water on the planet's surface. While water itself is not blue, water gives off blue light upon reflection. In simplest terms, water makes up about 71% of the Earth's surface, while the other 29% consists of continents and islands. To break the numbers down, 96.5% of all the Earth's water is contained within the oceans as salt water, while the remaining 3.5% is freshwater lakes and frozen water locked up in glaciers and the polar ice caps. Of that fresh water, almost all of it takes the form of ice: 69% of it, to be exact. If you could melt all that ice, and the Earth's surface was perfectly smooth, the sea levels would rise to an altitude of 2.7 km. Aside from the water that exists in ice form, there is also the staggering amount of water that exists beneath the Earth's surface. 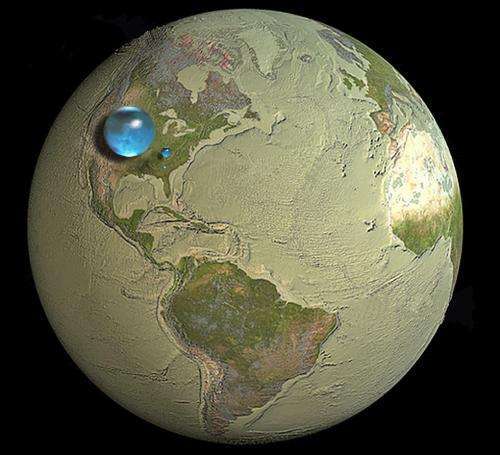 If you were to gather all the Earth's fresh water together as a single mass (as shown in the image above) it is estimated that it would measure some 1,386 million cubic kilometers (km3) in volume. But how much of Earth is water—how much water contributes to the actual mass of the planet? This includes not just the surface of the Earth, but inside as well. 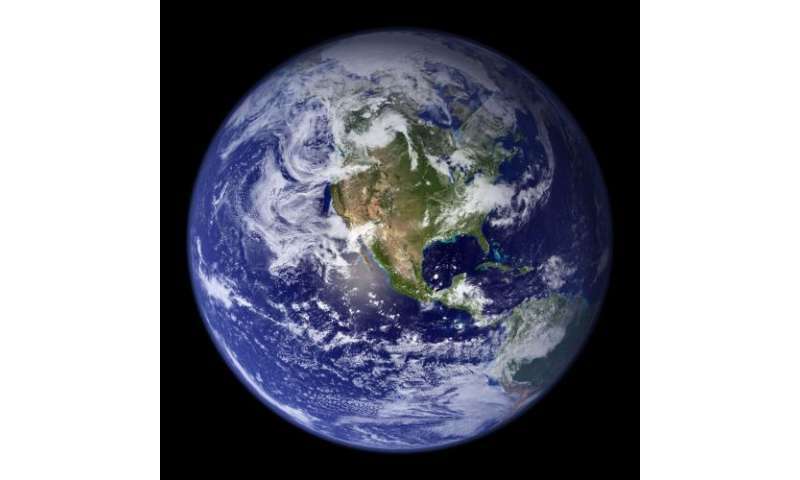 Scientists calculate that the total mass of the oceans on Earth is 1.35 x 1018 metric tonnes, which is 1/4400 the total mass of the Earth. In other words, while the oceans cover 71% of the Earth's surface, they only account for 0.02% of our planet's total mass. The origin of water on the Earth's surface, as well as the fact that it has more water than any other rocky planet in the Solar System, are two of long-standing mysteries concerning our planet. Not that long ago, it was believed that our planet formed dry some 4.6 billion years ago, with high-energy impacts creating a molten surface on the infant Earth. 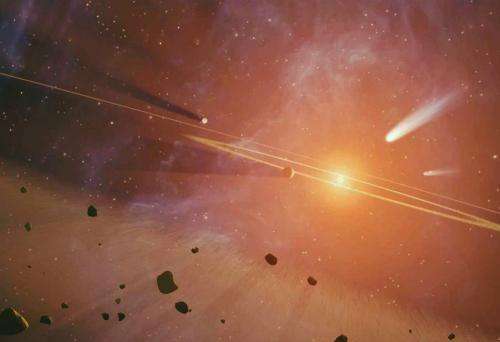 According to this theory, water was brought to the world's oceans thanks to icy comets, trans-Neptunian objects or water-rich meteoroids (protoplanets) from the outer reaches of the main asteroid belt colliding with the Earth. However, more recent research conducted by the Woods Hole Oceanographic Institution (WHOI) in Woods Hole, Massachusetts, has pushed the date of these origins back further. According to this new study, the world's oceans also date back 4.6 billion years, when all the worlds of the inner Solar System were still forming. I have a problem with water.. It is made up of 2 parts hydrogen and one part oxygen.. So why is it so heavy? Because water, as a liquid, likes to pack itself very very tightly together. The Hydrogen atoms form a bit of a V shape rather than a straight line (think Mickey Mouse ears). Their electrons then spend more time near the Oxygen atom (at the center of the V) than around the Hydrogen end, leaving the molecule with a "polarity," one side being a bit more positive than the other. Then, somewhat like magnets, the positive end of one attracts the negative end of its neighbor and so on. This holds them very close together, thus being of a pretty high density, even at moderate temperatures. I have a problem with water too. Hydrogen isn't wet. And oxygen isn't wet. Sup wit dat? These numbers may have been grossly underestimated. This article makes no mention of water in the mantle which has been supported by numerous studies and articles outlining discoveries in June, July and August of this year. Good question. What is "wetness" anyway? Are all fluids wet - what about oils, or mercury? See Shavera's answer, above - the charge separation caused by mutual repulsion between the two unbound electrons of the oxygen atom gives the hydrogen bond a 104.5° angle, and the water molecules a resulting polarity with respect to one another and also to other molecules and surfaces. This is why water has surface tension effects, and also why it adheres to many other surfaces (or conversely, why it can be positively repulsed by hydrophobic ones). The hydrogen bond is key to water's properties - it's like a weaker form of covalent bond, caused by this polarity feature, rather than shared valence electrons. This weakness gives water its low viscosity and tight packing geometry in the fluid state. In the solid state, the bond locks into place, causing a reduced density, raised buoyancy, the distinctive hexagonal symmetry of ice crystals & snowflakes, and "dryness". Summarising the above (i ran out of space) - the short answer is electrostatic adhesion (of the same kind as van der waals force) - a function of the relative intra-molecular attraction (or repulsion, which would be negative adhesion) of the fluid to other molecules of itself compared to those of another material - the corollary concept being the 'wettability' of the material, relative to a given fluid. In other words it's not water itself that's wet - strictly speaking, wetness isn't a property of water - but rather the nature of the interaction between it and other stuff. So there you have it: in future, should anyone ask you why water's wet, you can tell them it isn't. Good one! Say, if like charges repel and unlike charges attract, how do you explain electron pairing and atoms not collapsing on themselves?